Today, I am posting my review on Social Snap – a social media sharing WordPress plugin. But before that, I hope you know the importance of sharing your blog updates on social platforms! 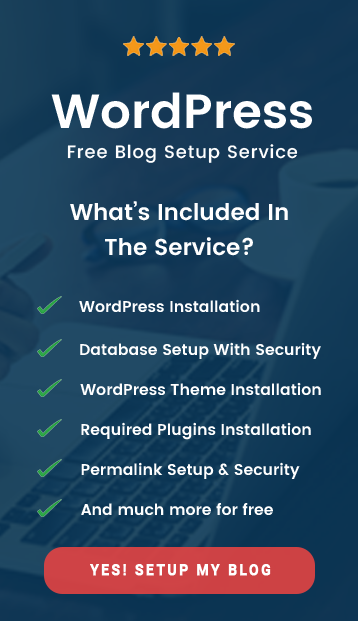 As Social Media Platforms are the second highest traffic source for the majority of successful businesses and WordPress websites across the internet after Organic traffic. Social Snap Exclusive Deal for TheMaverickSpirit Users! Get 10% OFF on All Social Snap Premium Plans. Now, all you need to integrate the social share buttons on your website in order to harness the power the social media. And, the ultimate social sharing WordPress tool that I discovered and use for TheMaverickSpirit is SocialSnap. Read the complete Social Snap review which is easy to install + provide stats, analytics, auto-poster, boost old post.. unlike any other tools! SocialSnap is an all-in-one digital marketing toolkit for Social Media that helps you to boost your website’s traffic and engagement. It is way more than just a WordPress social share plugin! The one and only tool that provides you complete stats and allows you to control how visitors share & view your content. ***Try risk-Free! 30-day money-back guarantee with No questions asked. How is SocialSnap Different From Other Social Media Plugins? Well, I have tried to wrap why Social Snap is the best social sharing WordPress plugin in five points. Social snap not only just have social sharing and social following buttons! Social Snap is fast and gives high performance. It is all possible as the social media plugin is optimized to maintain the website’s speed and performance. It loads JS files asynchronously so it doesn’t slow down your website. On the other hand, it uses super-lightweight SVG vector icons instead of images that make it load fast and look beautiful across all the devices. Social Snap display social counter without connecting network API’s by tracking the number of clicks on the network buttons. 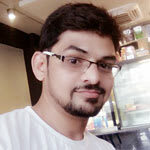 A unique inbuilt feature when compared to other social media sharing plugins. Social Snap lets you enable or disable the share button on an individual post. It doesn’t matter even if you’re using a classic editor or latest Gutenberg WordPress Editor. We’ve seen many social sharing plugins having issues with the responsiveness in mobile, small screen devices or any other viewing devices. and 100% mobile responsive in any viewing device. Social Snap Features – All-in-One WordPress Social Media Toolkit for Bloggers! Social Snap is a feature-rich WordPress plugin for social media marketing. It is an all in one social media toolkit for bloggers and marketers. 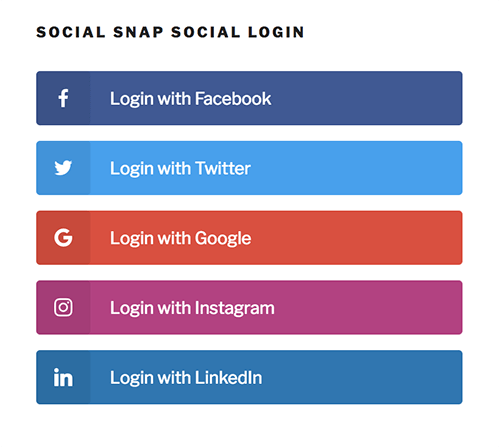 Social Snap offers responsive social share buttons for all the devices with different social media networks, different placement locations on websites, and much more. Social Snap lets you and your visitors share your website’s content on over 30+ social networks and apps. 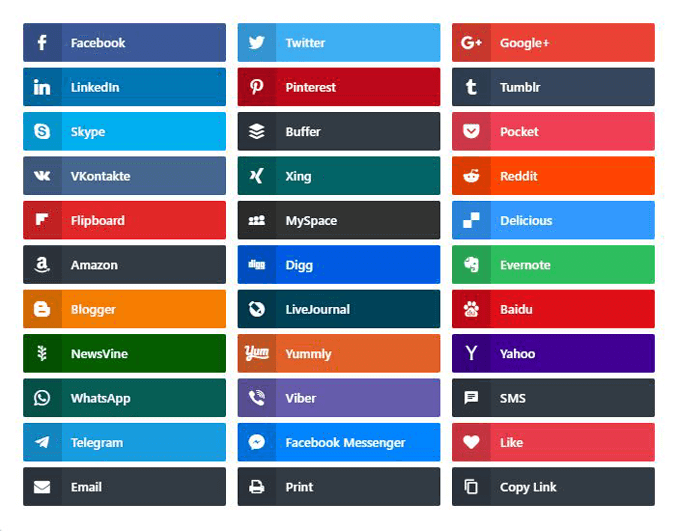 You are likely to find almost all of your favorite social networks in this tool. (b) Share Locations on Websites – Place Share Buttons Anywhere! You can add SocialSnap social share buttons to multiple locations on your website. All placement positions are highly customizable and optimized to boost your social shares. Where to place social share buttons on website? (c) Highly Customizable – Choose Button Shapes, Colors, Animations & Much More! Social Snap offers high-end UX/UI mobile responsive social share buttons. You can easily customize button shapes, colors, animations and much more to match your website’s design. Displaying share counts encourage your website visitors to share your content even more. You can choose when and where you want to show the share counters to your users. You can display both total and individual share counts as social proof. There is also a minimum share count feature to avoid displaying 0 shares. When you publish a post, it’s obvious that it will have 0 shares and it won’t throw a nice impression because it’s better to display nothing instead of 0. For such type of situations, you can set your minimum share to 1. It will not display any share count until you get at least 1 share. Social Snap grab share counts directly from the network via API. You can choose how often to update (in hours) the share counts. It is important to schedule the update because it can affect website performance. I will recommend you to update counts once in a day or maximum twice. Social Snap also has a feature to display share counts on the basis of Clicks. That means there’s no need to connect social network API’s to display share counts. Social Snap displays how many people have seen the page or post. Social Snap offers some advanced analytics functionality. It uses Google Analytics event tracking (UTM parameters) and notifies Google Analytics whenever a user clicks on your share buttons. Social Snap recovers your lost share counts in just a few clicks. Social Snap lets you connect your Bitly account and shortens your share URLs so that you can track how your links are performing. Social Snap adds a metabox to each of the posts backend so that you can enable/disable the share button on an individual post. Social snap adds a setting in the Document Settings to enable/disable the share buttons on an individual post. You can check out our Gutenberg WordPress Editor Guide if you’re not aware of the new generation WordPress editor. Social Snap lets you add follow buttons of 40 Social Networks. 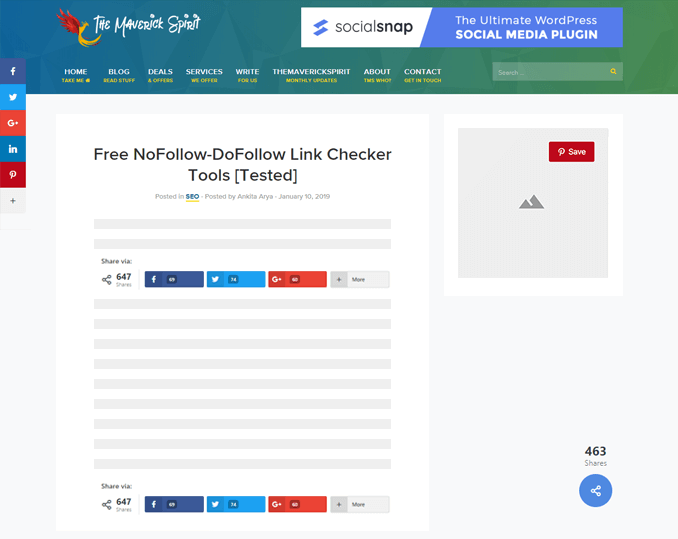 You can grow your social following with social follow buttons and fan counters. Allow users to follow your brand across all your preferred social networks easily. 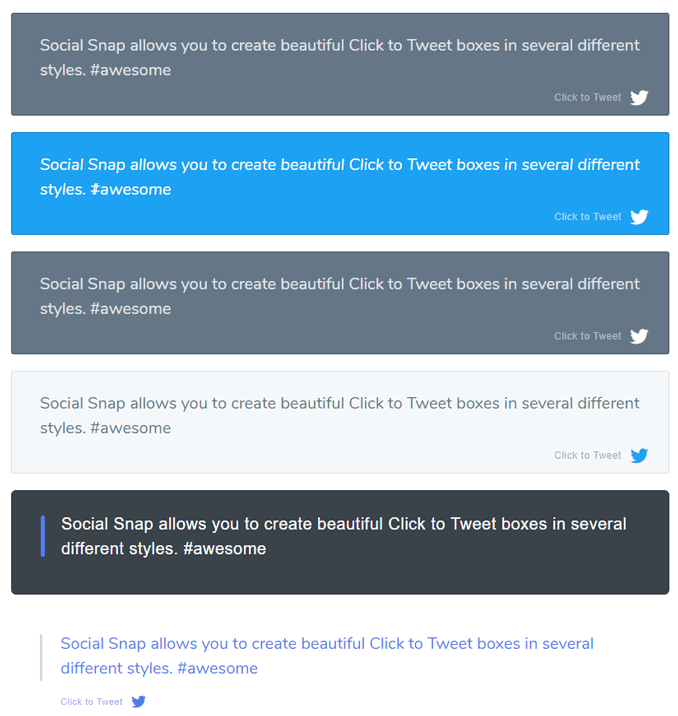 Social Snap lets you add “Click to Tweet” quote boxes across any post, page or sidebar. Click to tweet buttons are more compelling call to actions for website visitors to share your content. And the best part is that – You can choose from multiple design styles for Click to Tweet boxes to help match your site’s design. Social Snap also lets you add up to two Twitter accounts that Twitter will suggest to the user to follow after he’s posted a Tweet. Social Snap lets you customize the look of your post when shared on social media. You can test the different options and analyze which is performing well on social media in terms of engagement and click-through rate. You can add a custom image, title and description when shared on social media. 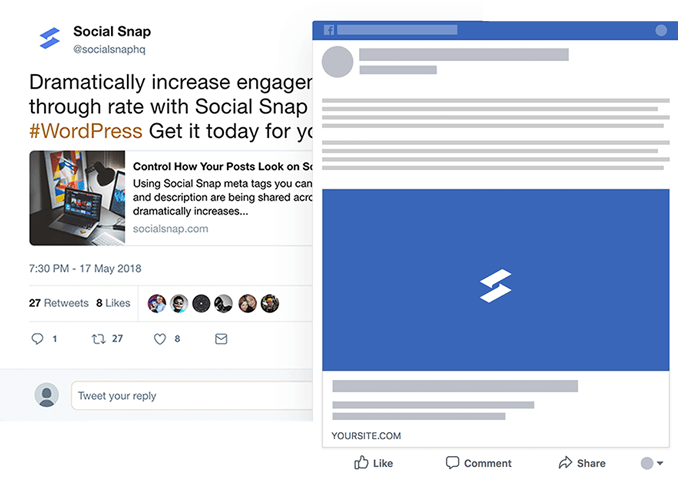 In short, you can change Facebook’s Open Graph and Twitter Cards meta information when a page or posts gets shared on social media. Social Snap gives you a detailed analytics report about shares, click to tweets, top performing posts and much more. You can always improve and enhance your social sharing strategy by checking, analyzing and keeping a track of all the statistics and analytics provided by Social Snap. Social snap provides you real user data from your social sharing which lets you track and understand how your visitors are engaging with your content. Social Snap lets you filter social share counters, social follow and click to tweet statistics so that you can know exactly what’s working and what’s not. It also lets you filter by specific social network, metrics, time frames, placements and much more. You can keep track of per page or per post statistics to understand which page or post needs improvement and which is already doing well. You can filter them by month, week, day. Social Snap displays the top performing content of your website to users and website visitors to boost up the engagement. 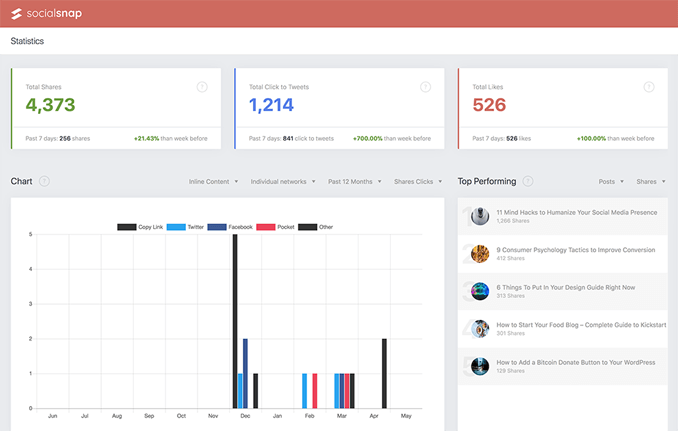 You can easily track your top performing page and post statistics. Social Snap addons made this Social Sharing WordPress Plugin a powerful social media toolkit. Right now, Social Snap offers 3 add-ons and will soon introduce the 4th one. It allows your website visitors to log in using Facebook, Twitter, Instagram, LinkedIn, and Google. If an old post is not ranking or doing well, it hardly gets any traffic or new visitors. Isn’t it? Social Snap shares your existing old posts automatically on Twitter and Linkedin. It’s a great way to bring traffic through your old posts and reach new visitors! Social Snap automatically shares your newly published posts to Twitter and LinkedIn. It definitely saves your time as you probably did that manually across each platform. With the help of a content locker, you can hide the key content and place a button over the content. By doing so, you can ask your visitors to share the content on social media if they wish to access the content behind the button. 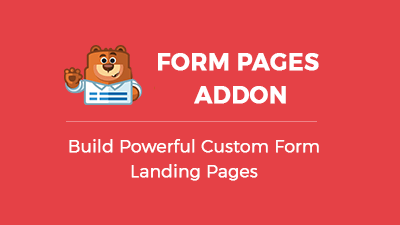 These powerful add-ons not only saves your time and money but also make sure that your website receives more traffic, more followers and more user engagement. Social Snap offers 3 pricing plans. 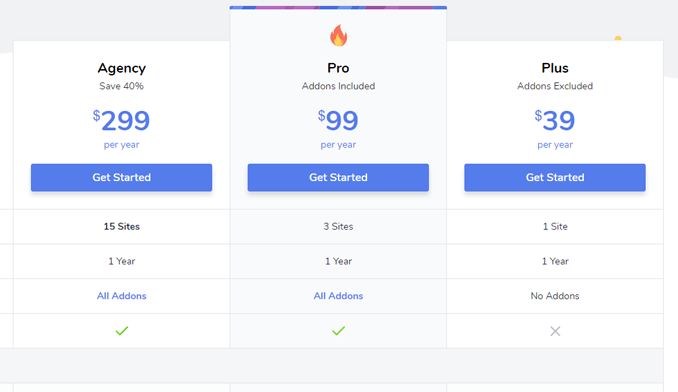 Plus plan is $39/year for 1 site and has all the above features except for the addons and priority support. So no auto-poster, no social login, no boost old posts or any of the upcoming addons. I believe it’s an ideal plan for beginners & bloggers as it’s very economical compared to what it’s providing. or Agency plan for $299/year for 15 sites. They both get you to access to all the premium features that Social Snap has to offer. Agency plan is best suitable for developers & businesses with multiple WordPress websites. Social Snap also offers a free version of the tool which you can download from WordPress plugin repository anytime. It has very limited features but enough to give you an idea of how this tool extends the power of Social Media Marketing. As I said before starting the Social Snap review that it’s more than just a social sharing or social following plugin. I will continue to stick with it till now! As I really enjoyed the user experience both from the front-end and back-end. It beautifully crafted its basic features like button customization, placement options, responsive controls for different devices. 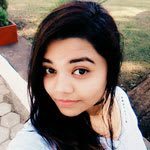 On the other hand, it also worked well on advanced features like advanced analytics and statistics, click tracking without API, addons like social auto poster, boost old posts and social login. In the end, it’s up to you what suits your requirement and budget well. I will recommend you to – Try SocialSnap Pro version as they offer a 30-day money-back guarantee. You can get your money back just in case Social Snap won’t meet your expectations. Hhhhhmmmmm….I look forward to trying it out soon, Majeji. Thanks for sharing. Glad you liked it, Edgar! As a newbie blogger, I love reading about the best and most current plugins. Thanks for sharing this! By far, my favorite feature you mentioned is the advanced analytics. Always good to know how your site is doing on social media! I never heard of social snap but thanks. This is good advice! Great Idea I’ve been trying to get some of those icons on my blog for the longest and I have been unsuccessful. I’ve been looking for an all in one plug-in for shares and follows. Definitely giving this a test run. Let me know your experience with SocialSnap!